WHAT DOES "FAT CAT PATTERNS" AND ISLAND BATIK HAVE IN COMMON???? LOTS AND LOTS OF CHICKENS!!! Hence the bad quality photos, had a piece of material to throw over them in case he came in. Some of them need eyes but I so love them. I love using the Island Batik fabrics (of course you do Barbara, of course you do......smiling shamefully here). Here is the link to Fat Cat Patterns, she has a lot of free patterns that You will totally love. I have been doing these after he goes to bed, make sure he is snoring, and then I drown myself in my Island Batik Scrap bin. It takes more time prepping these chickens than it does to blanket stitch around them. I don't believe that I have shown this quilt to you. Maybe on Facebook??? This quilt has a history. I loved applique from the very beginning. Most of these are done by hand and then later, much later after seeing the squares sit in the drawer for so long I did some on the machine and they still sat. My mother saw them and loved them so much that I gave her the squares and the fabrics to finish the top. She finished it about a year ago...at age 79, the top that is. I just finished quilting it and put the binding on. I have been relieved of a lot of responsibilities that take me out of the home which means I get to sew more. My major objective is to get a lot of these tops finished and hopefully, on the frame. I hope I can keep up the momentum. HAVE THIS PATRIOTIC RUNNER CUT AND READY BEFORE THE NIGHT IS OVER USING YOUR ACCUQUILT GO! This runner is so easy you can make this in one afternoon or evening after work. Fabric adhesive of choice - Heat N Bond was used here. Background fabric (white) 12"x 36"
Red fabric for rickrack 11-1/2" x 21"
Blue fabric for stars 6" x 14"
Cut out your background fabric 12" x 36". Section off the runner 7 1/2" from each end. Next draw 2" line on both sides of the middle line. Then draw 2" from those lines. You should have five lines for the rickrack. Prepare both red and blue fabric by ironing your fabric adhesive of choice to the wrong side of fabric. .Using your Accuquilt Go cutter, cut the rick rick out of the red. Next cut your Stars out. Place your rick rack down each line you have drawn. Iron down. Place your stars and iron down ( large star in the middle with the smaller ones to the side and up a little). You can either sandwich your runner (top, batting, backing) pin and then blanket stitch around all of the raw edges ( your quilting will be done at this point) or you can blanket stitch the raw edges and then sandwich and quilt as desired. Binding and you are done. All ready for Independence day!! If you saw the post below, you will know that these butterfly squares were found in my attic. At first I thought they were raw edge applique but on closer inspection the person turned under the edges and did a zig zag stitch over the edges. Now just to quilt it? Thanks for all of your comments as to what I should do, As you can see, I decided to just use the same fabrics. WHAT'S IN YOUR ATTIC? You show me yours and I will show you mine!! If you have been reading my post, you will know that when we moved here we found a bunch of antique quilt squares in my attic. Here are some butterflies. Whoever did this used the zigzag stitch. ......not that I don't have enough projects going on but I decided to put these together. Here are the pink butterflies, there are five in each color. The question is, do I do them all with the pink corners or do I use fabric that matches each butterfly. I have 17 different color variation of the pink flower fabric. Do I stick with the pink only or try to match up the butterflies to the fabric? Here is my finished "Accuquilt Go" doggie top. I am really amazed at how fast this went even with my grandson romping around my sewing room. As mentioned before, the doggie squares are all Island Batik fabric. I purchased this "Woof Woof" fabric a while back so I can't tell you where I brought it...sorry. I used Aurifil Thread #2318 2EQ...... I have to tell you that I am getting spoiled with this Aurifil thread, very little lint and I love the look of the blocks with the blanket stitch. I also just sewed the squares together with the same thread. Happy Father's Day to all of you Dad's out there!!! SHHHH!!!! IT IS A SECRET!!!! I am pretty sure that the two people I am making these for do not read my blog but to be safe I am not naming who the first quilt is for. Using my Accuquilt go doggie die and Island Batik Fabric I am making a doggie quilt. Now I know that my husband does not read my blog so I am making him a chicken quilt. I got these from FAT Cat patterns, love love Sindy's patterns, using Island Batik Fabrics except for the background fabric. I had purchased this fabric a long time ago with the intention of making another Chicken quilt. This is such a small picture but here is a chicken quilt I did in Amerika Samoa. The hard part about this is I have to hide what I am doing from my husband. He is always interested in what I am doing so when he slips off to bed I pull his quilt out. I only have two ready to stitch so who know how long this will take. Once again I have my grandson. He really is pretty good about staying out of things. I showed him the iron and said HOT HOT and ironed something and then after it cooled a second, still wanted it warm, put it up to his cheek so he would understand. So while he was playing I got the doggie squares ready. "MAKING HAY WHILE THE SUNSHINES" WINNER OF THE ISLAND BATIK CHARM PACK AND SUPERIOR THREAD. Have you ever heard the saying "Making Hay While the Sunshines?" It means that you take advantage of the chance to do something while conditions are good.! Conditions are good at Bejeweled's house so I am taking advantage of every spare minute. Who knows what can happen tomorrow. 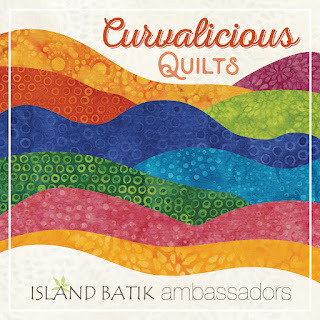 I finished my July Project for Island Batik!! I used all of my Solstic Island Batik Fabric on my September project for Island Batik. Yes, I planned ahead but not well enough....my September project just kept growing and growing. Here is another sneak peak of my september project... Beautiful fabrics. Both projects I used my Accuquilt Go, sure makes light work especially for someone like me who loves doing blanket stitch applique. Here he is playing while I am trying to sew. Life just does not get any better than that does it??? Your tuffets are absolutely delightful! I appreciated your engaging blog post too. Thanks for the fun! 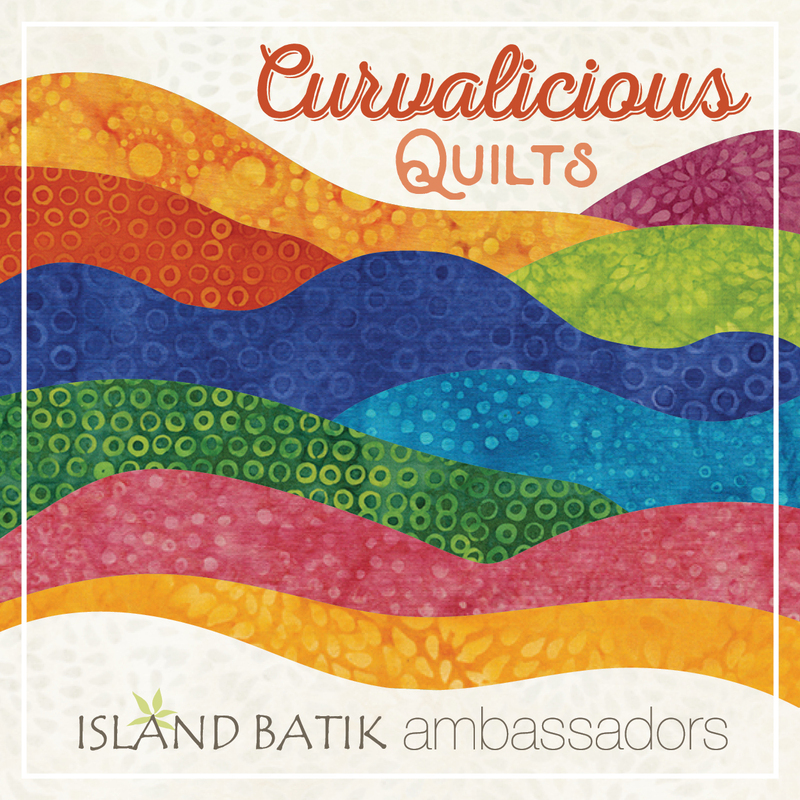 The month of June is Curvavalicious Quilts for the Island Batik Ambassadors. We were told we could do anything with curves so here goes. For those of you that don't know, Jeanette, from Inchworm Fabrics is my sister. Recently we moved our mother into a little trailer right off my carport so Jeanette came for a visit. Glad she did because she was able to go through and get rid of a lot of clothes that my mother had collected through the years. We had discussed making something together for our June Island Batik project. You know...two minds, twice the smoke. She came up with the idea of tuffets. So we scoured the internet and settled upon "Mini Tuffet Pinchsion" by Sew Colorful LLC, Sylvi Sealy. just click on that link and it will take you to her craftsy site. One evening Jeanette came in from my mother's and said...you wanna go to walmart and get supplies for the tuffets? I said, sure...what time is it. She said 7:30....why not, it is early still. We got home at 11:30.....hummmmm I said...Jeanette, thought it was 7:30 when we left...she looked at her watch and said...yes, 7:30 my time (Washington State time). Needlesss to say we got a laugh out of that one. So we took off with our supply list. We were able to get everything we wanted at Walmart to make small and larger tuffets. Here is a larger one. Jeanette is so smart...she just whipped up another pattern larger than the one given to us that enabled us to make us a larger tuffet. Worked out great. Don't you just love the tuffets??? We made the larger ones the next day while my grandson was running around the sewing room getting into stuff. Were we crazy or what? My mother did entertain the little buggar for us so we could finish up a few more. Every so often he would come and go UP...Up...so of course, up he came and the work stopped. Have you ever seen such a fun sight? She did the sewing and I did the stuffing, cutting, and gluing. One thing that worked out good was making cardboard round pieces that matched the wooden pieces for the bottom. We glued the fabric to the cardboard round piece, put the button on and and pulled it through, then glued the wood circle over that so we could glue on the legs. Worked perfect! I can only say how fun this was working with my sister and how clear the pattern was to follow. We gave one large one to our sister Beverly, it was her birthday. Gave one small one to my mother and then we both got a large and small one. This is what mine looks like right now..... No losing this pin cushion. If you want, go check out my sister's blog, she is having a giveaway and so I am. One Island Batik Charm pack "BluShing Blooms"
It truly hurts to give these items away but why not share the fun RIGHT???? I do love Superior Threads, I have used them numerous times and have even ordered from them, I just happen to have duplicate of the orange thread because I loved the Fantastico line so much that I ordered me some and then Island Batik sent me some of the same not knowing. Now the Charm pack is loaded with vibrant delicious colors, if you can put delicious onto a charm pack? Only a quilter will know and understand that comment. Just leave a comment and do go and visit my sister.